The key spectroscopic feature associated with assembly of 1 are the changes in the 1H chemical shifts with increasing concentration. 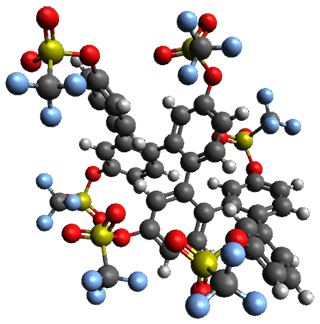 For example, the chemical shift of the three protons on the triphenylene unit shift upfield by 0.30 to 0.66 ppm as the concentration increases from 10-5 to 10-2 M.
To see if these NMR shift changes are due to association of 1, they employed a computational approach. 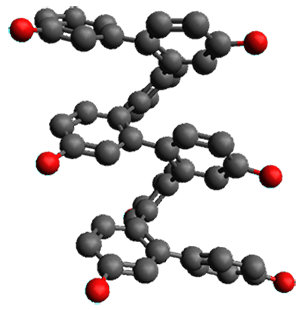 First they optimized the structure of model compound 2 at B3LYP/6-31G(d) (Shown in Figure 1a). Then using this fixed geometry, they computed the 1H chemical shifts of the dimer of 2. They explored the stacking distance (ranging from 3.2 to 4.0 Å along with varying the displacement of the two molecules along the major axis from 0.0 to 6.0 Å, finding the best fit to the chemical shifts with a separation of 3.6 Å and a displacement along the major axis of 3.5 Å. Using these two fixed values, they explored displacement of the molecules along the minor axis, along with rotation of the two molecules. The best fit to the experimental chemical shifts was with a displacement of 0.5 Å along the short axis and no rotation. 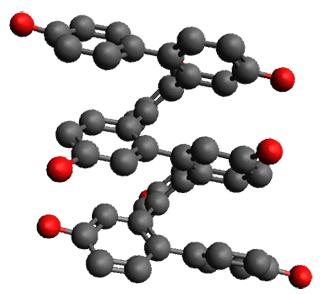 This structure is shown in Figure 1b, with a RMS error of only 0.09 ppm from experiment. Models of the trimer show poorer fit to the experimental data. 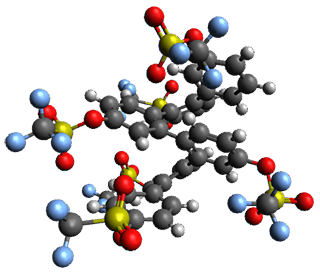 Using some smaller models and the B97-D functional, they argue that the displacement, which is substantially larger than the displacement found in stacked triphenylene, results from the need to minimize the steric interactions between the alkoxyl chains. (1) Chu, M.; Scioneaux, A. N.; Hartley, C. S. "Solution-Phase Dimerization of an Oblong Shape-Persistent Macrocycle," J. Org. Chem. 2014, 79, 9009–9017; DOI: 10.1021/jo501260c. 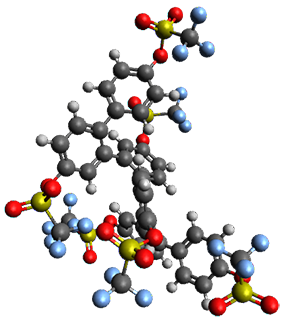 An alternative take on the nature of the interaction in π-stacking is offered by Wheeler and Houk.1 They start by examining the binding between benzene and a series of 24 substituted benzenes. Two representative dimmers are shown in Figure 1, where the substituent is NO2 or CH2OH. 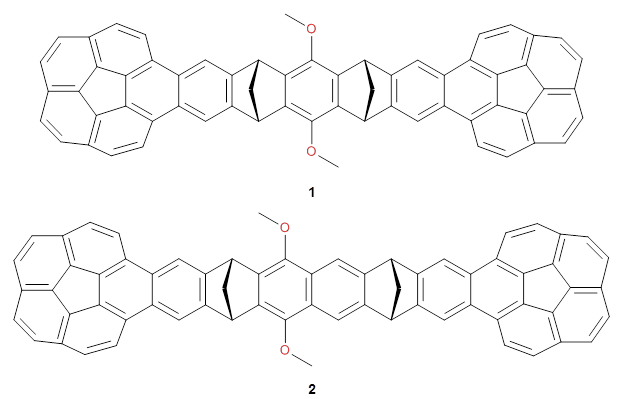 As was noted in a number of previous studies,2-6 the binding with any substituted benzene is stronger than the parent benzene dimer. Nonetheless, Wheeler and Houk point out that the binding energy has a reasonable correlation with σm. It appears that the benzene dimer itself is the outlier; the binding energy when the substituent is CH2OH, whose σm value is zero, is bound more tightly than the benzene dimer. They conclude that there is a dispersive interaction between any substituent and the other benzene ring. 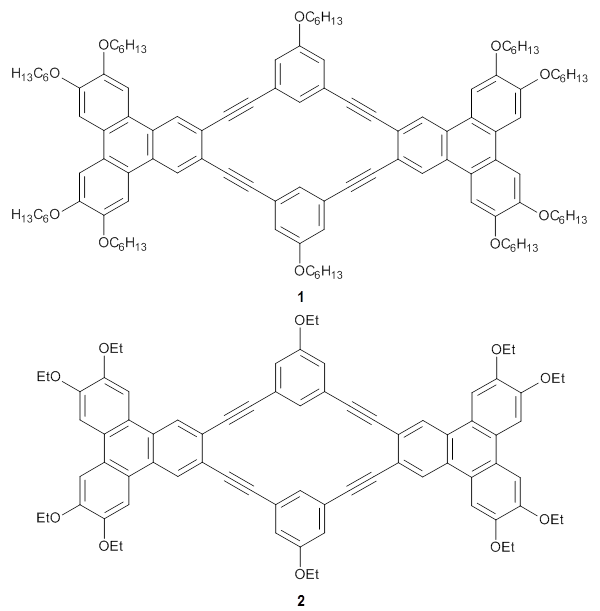 They next constructed an admittedly very crude model system whereby the substituted benzene C6H5X is replaced by HX; the corresponding models are also shown in Figure 1. The binding energies of these model dimmers correlates very well with the real dimmers, with r = 0.91. Rather than involving the interaction of the π-electrons, the origin of the enhanced binding in aromatic dimers involves electrostatic interactions of the substituent with the other aromatic ring – effectively the quadrupole of the unsubstituted ring interacts with the dipoles of the substituent and its ring system. In addition, the inherent dispersive interaction increase the binding. (1) Wheeler, S. E.; Houk, K. N., "Substituent Effects in the Benzene Dimer are Due to Direct Interactions of the Substituents with the Unsubstituted Benzene," J. Am. Chem. Soc., 2008, 130, 10854-10855, DOI: 10.1021/ja802849j. (2) Sinnokrot, M. O.; Sherrill, C. D., "Unexpected Substituent Effects in Face-to-Face π-Stacking Interactions," J. Phys. Chem. A, 2003, 107, 8377-8379, DOI: 10.1021/jp030880e. 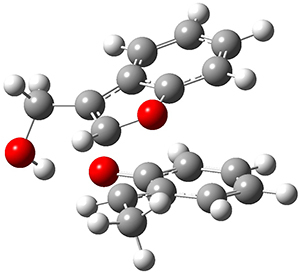 (3) Sinnokrot, M. O.; Sherrill, C. D., "Substituent Effects in π-&pi Interactions: Sandwich and T-Shaped Configurations," J. Am. Chem. Soc., 2004, 126, 7690-7697, DOI: 10.1021/ja049434a. (5) Lee, E. C.; Kim, D.; Jurecka, P.; Tarakeshwar, P.; Hobza, P.; Kim, K. S., "Understanding of Assembly Phenomena by Aromatic-Aromatic Interactions: Benzene Dimer and the Substituted Systems," J. Phys. Chem. A 2007, 111, 3446-3457, DOI: 10.1021/jp068635t. 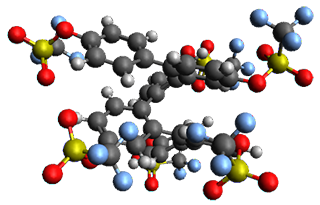 The importance of the interactions between neighboring aromatic molecules cannot be overemphasized – π-π-stacking is invoked to explain the structure of DNA, the hydrophobic effect, molecular recognition, etc. Nonetheless, the nature of this interaction is not clear. In fact the commonly held notion of π-π orbital overlap is not seen in computations. Grimme1 has now carefully examined the nature of aromatic stacking by comparison with aliphatic analogues. He has examined dimers formed of benzene 1, naphthalene 2, anthracene 3, and teracene 4 and compared these with the dimers of their saturated analogues (cyclohexane 1s, decalin 2s, tetradecahydroanthracene 3s, and octadecahydrotetracene 4s. 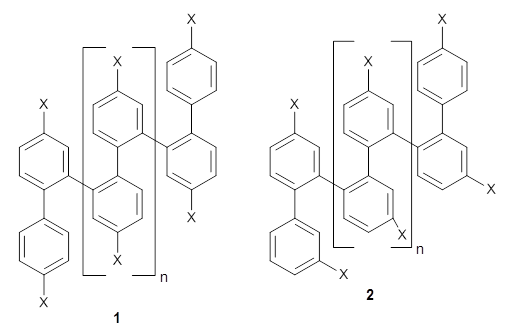 The aromatic dimmers were optimized in the T-shaped and stacked arrangements, and these are shown for 3 along with the dimer of 3s in Figure 1. 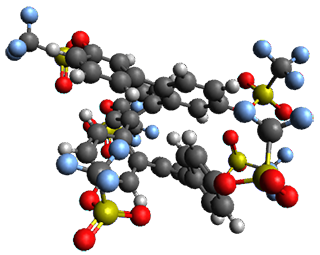 These structures are optimized at B97-D/TZV(2d,2p) – a functional designed for van der Waals compounds. Energies were then computed at B2LYP-D/QZV3P, double-hybrid functional that works very well for large systems. Figure 1. Optimized structures of 3s, 3t, and 3a. The energies for formation of the complexes are listed in Table 1. The first interesting result here is that the benzene and naphthalene dimmers (whether stacked or T-shaped) are bound by about the same amount as their saturated analogues. Grimme thus warns that “caution is required to not overestimate the effect of the π system”. 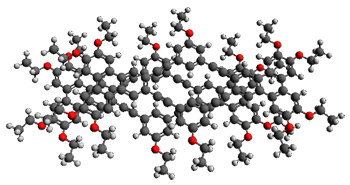 The two larger aromatics here do show a significantly enhanced complexation energy than their saturated analogues, and Grimme refers to this extra stabilization as the π-π stacking effect (PSE). 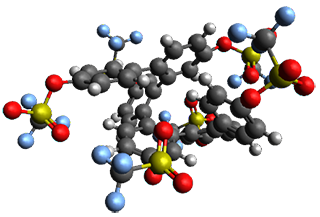 Energy decomposition analysis suggests that electrostatic interactions actually favor the complexation of the saturated analogues over the aromatics. However, Pauli exchange repulsion essentially cancels the electrostatic attraction for all the systems, and it is dispersion that accounts for the dimerization energy. Dispersion increases with size of the molecule, and “classical” dispersion forces (the R-6 relationship) accounts for more than half of the dispersion energy in the saturated dimmers, while it is the non-classical, or orbital-based, dispersion that dominates in the stacked aromatic dimmers. Grimme attributes this to “special nonlocal electron correlations between the π electrons in the two fragments at small interplane distances”. 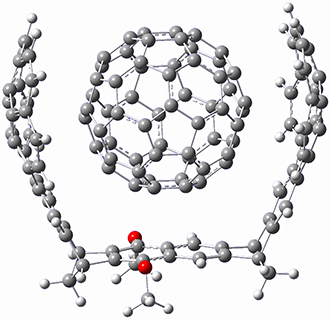 (1) Grimme, S., "Do Special Noncovalent π-π Stacking Interactions Really Exist?," Angew. Chem. Int. Ed., 2008, 47, 3430-3434, DOI: 10.1002/anie.200705157. I did not present π-π stacking in the book, but I think if I ever do a second edition, I will include a discussion of it. I’m not sure quite where it would fit in given the current structure of the book (I discuss DNA bases and base pairs in the context of solvation in Chapter 6), but the paper I will discuss next gives me some idea – π-π stacking is a sensitive test of the quality of computational methods and this could be part of Chapter 1 as a discussion of the failings of methods, especially DFT. Swart and Bickelhaupt have examined a series of π-π stacked pairs, evaluating them regarding how DFT performs.1 Their first example is the benzene dimer (Table 1). 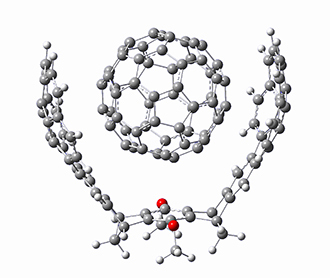 At CCSD(T) the dimer binding energy is 1.7 kcal mol-1 and the rings are 3.9 Å apart. LDA, KT1 (yet another newly minted functional2,3), and BHandH get the separation and binding energy reasonably well. PW91 gets the distance too big and underestimates the binding energy. But most important is that the other (more traditional) functionals indicate that the PES is entirely repulsive! This is a manifestation of many functionals’ inability to properly account for dispersion. Next, they compare 14 different orientations of stacked dimmers of cytosine. The energies of these dimmers were computed using again a variety of functionals and compared to MP2/CBS energies with a correction for CCSD(T). The mean absolute deviations (MAD) for the energies using the various functionals are listed in Table 2. Again, LDA and KT1 perform quite well, but most functionals do quite poorly. 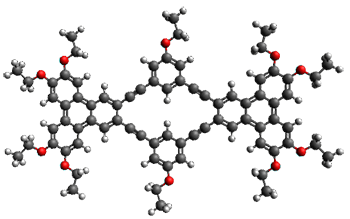 stacked dimer structures compared to their MP2 energies. Similar results are also demonstrated for stacked DNA bases and also stacked base pairs. These authors conclude that the KT1 functional appears suitable for treating π-π stacking. One should also consider some of the new functionals from the Truhlar group,4-6 which unfortunately are not included in this study. (1) Swart, M.; van der Wijst, T.; Fonseca, C.; Bickelhaput, F. M., "π-π Stacking Tackled with Density Functional Theory," J. Mol. Model. 2007, 13, 1245-1257, DOI: 10.1007/s00894-007-0239-y. (3) Keal, T. W.; Tozer, D. J., "A Semiempirical Generalized Gradient Approximation Exchange-Correlation Functional," J. Chem. Phys. 2004, 121, 5654-5660, DOI: 10.1063/1.1784777. (5) Zhao, Y.; Schultz, N. E.; Truhlar, D. G., "Design of Density Functionals by Combining the Method of Constraint Satisfaction with Parametrization for Thermochemistry, Thermochemical Kinetics, and Noncovalent Interactions," J. Chem. Theory Comput., 2006, 2, 364-382, DOI: 10.1021/ct0502763. Is CCSD(T)/CBS really the gold standard? (1) Řezáč, J.; Hobza, P. "Describing Noncovalent Interactions beyond the Common Approximations: How Accurate Is the “Gold Standard,” CCSD(T) at the Complete Basis Set Limit?," J. Chem. Theor. Comput., 2013, 9, 2151–2155, DOI: 10.1021/ct400057w. I am very much contemplating a second edition of my book Computational Organic Chemistry, which is the basis of this blog. I have been in touch with Wiley and they are enthusiastic about a second edition. So, I would like to ask my readers for suggestions of other ideas for new topics to add to the book. These can be extensions of the topics already covered, or brand new areas! Additionally, I am planning on interviewing a few more people for the book, similar in spirit to the 6 interviews in the first addition. Again, I welcome any suggestions for computational chemists to interview!